J Oral Pathol Med, 2016, 45(8):605-12.. PH-797804 purchased from Selleck. Effect of MEK inhibitor PH-797804 in A549 cells. A549 cells were incubated with increasing concentrations of PH-797804 for 2 h. The cell lysates were harvested and phosphorylation of indicated proteins was determined by Western blotting. Dr.Wang from Southern Medical Hospital . PH-797804 purchased from Selleck. A resin capture assay method is used to determine the phosphorylation of epidermal growth factor receptor peptide (EGFRP) or GST-c-Jun by p38 kinases. Reactions mixtures contain 25 mM HEPES, pH 7.5, 10 mM magnesium acetate, ATP (at the indicated concentration), 0.05 to 0.3 μCi of [γ-33P]ATP, 0.8 mM dithiothreitol, and either 200 μM EGFRP or 10 μM GST-c-Jun for p38α kinase reactions. The reaction is initiated by the addition of 25 nM p38α kinase to give a final volume of 50 μl. The p38αkinase reactions are incubated at 25 °C for 30 minutes. Under these conditions, the formation of product for both p38αkinase is linear with time. The reaction is stopped, and the unreacted [γ-33P]ATP is removed by the addition of 150 μl of AG 1 × 8 ion exchange resin in 900 mM sodium formate, pH 3.0. Once thoroughly mixed, solutions are allowed to stand for 5 minutes. A 50-μl aliquot of head volume containing the phosphorylated substrate is removed from the mixture and transferred to a 96-well plate. MicroScint-40 scintillation cocktail (150 μL) is added to each well and the radioactivity quantities using a TopCount NXT microplate scintillation and luminescence counter. Cell viability is evaluated using the 3-(4,5-dimethylthiazol-2-yl)-) diphenyl tetrazolium bromide assay. Absorbance is measured on an ELISA plate reader with a test wavelength of 570 nm and a reference of 630 nm. Formulation: PH-797804 is prepared as a suspension in a vehicle consisting of 0.5% methylcellulose and 0.025% Tween 20. Hope HR, et al, J Pharmacol Exp Ther, 2009, 331(3), 882-895. Xing L, et al. Biochemistry, 2009, 48(27), 6402-6411. 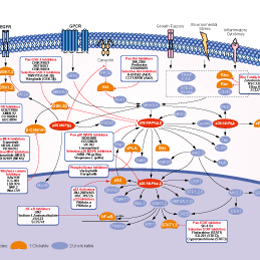 VX-702 : Phase II for Rheumatoid Arthritis.